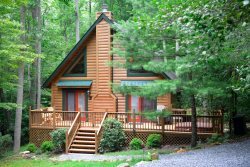 Come and get away in the perfect Blue Ridge Cabin Rental! A Creek Runs Thru It is a very quiet and secluded water front cabin that has the rustic touches that you love, but all the conveniences and upgrades from home. This North Georgia vacation rental is perfect for the whole family, just the two of you, or two couples. Just a note that this cabin is kid-friendly. Outside around the cabin you will be amazed at the gentleness of the land and with a great and easy access to the private creek frontage you will certainly feel like you are in a "park like" setting. While outside enjoy the beautiful sound of the creek or an outdoor fire in the fire pit while resting in a large hammock which hangs between two trees by the creek. You may also access the famous Benton McKay Trail, one of the longest spurs off of the Appalachian Trail, which is less than one half mile from the cabin. Also at the cabin, have fun while roasting marsh mellows or hot dogs over the open fire, take a dip in the cool and refreshing mountain waters, or try your hand at a little native trout fishing. The kids will be sure to love this waterfront Blue Ridge, GA cabin rental as well, you could even set up a tent for the kids outside in the flat back yard along the banks of the creek, while the parents have a romantic evening to themselves inside the cabin. Also, while relaxing at the cabin, and maybe reading your favorite book, just open the door and listen to the creek from every room in the house, and especially during those cool nights, let the steady sounds of the rippling water help put you to sleep. "A Creek Runs Thru It", is an end of the road cabin, meaning that no one uses the same road or driveway to go past this house, this is very private and you cannot see another house from this cabin. Also, this cabin is very close to United States National Forest, making it great for a wonderful nature hike, less amount of neighbors in the general area, and some high chances of seeing some native wildlife like deer, turkey, and even a bear. A Creek Runs Thru It is only about ten to twelve minutes from the downtown area of beautiful Blue Ridge, GA. In town you can find great eateries, wonderful mountain style shopping, and beautiful breathtaking views all around. Also, Lake Blue Ridge is about twelve minutes from the cabin where you can rent pontoon boats, fish, ski, and just simply relax. A couple of other fun and exciting things to do in the area is horseback riding, with Adventure Trail Rides, which is only about three or four minutes from the cabin, and white water rafting on the Ocoee River, with Raft One, the site of the 1996 Olympics, which is about fifteen minutes from the cabin. Very good. It was nice that someone called prior to us arriving asking if we had any questions. Check-in was quick and easy. And someone called the next day (even though I had no cell service) and left a message checking in to make sure everything was okay. Our friends and my husband and I had a really great time at the cabin. It was the perfect size for us and had all of the amenities that we were looking for in a cabin at a good price. I only heard from yall through email, but everything was very clear and friendly! 10/10 will recommend and stay again! The cabin was beautiful!! Absolutely loved the view! This was the second time staying in this cabin. It is one of our favorite places. We love using Georgia Mountain Cabins. Amber has always been great! This is the only Cabin we stay at which may have to change with all the new ones going up. Staff was both knowledgeable and courteous. Whenever I stopped by the office they stopped what they were doing to accommodate me. Great property, great location, and cozy cabin. We spoke often to Amber and she was very friendly and took care of all or needs. Great experience, loved the vacation! Stayed in a cabin called "A Creek Runs Thru It" in Cherry Log during the week of 3/19/18. This locations is one of the most beautiful places I have ever seen. The drive to the cabin was a little bit challenging with its mountainous dirt and gravel roads. We had to really pay close to the directions that were provided at check in, but once we got there, Holy Cow, this place is so peaceful and serene. Very secluded location. The creek behind the cabin is quite spectacular with its fast flowing clean clear water and with small water falls. The sound from the creek at night was tranquil. Once we arrived at the cabin, we found it to be very clean and well equipped with everything that we could possibly need to enjoy our trip including; a fully equipped kitchen, a game room with a pool table, foosball table, Wii system and lots of board games. The cabin was three stories with 3 bedrooms and 3 bathrooms including a loft. It also had a juquizzi tub, three hammocks, a fire place and a fire pit. Staff were very pleasant and provided great info about the local area and even called the cabin to that we were enjoying our stay. We stayed three nights and did not want to leave. Great place to unwind and relax. We will definitely be returning. As a side note: Cell service is sketchy at best but our cabin had good Wifi. Don't rely on GPS navigation to find your way around this area. This is a remote location, so, bring what you need with you as trips to the grocery store could be challenging. Easy to work with and pleased with our cabin & the easy checkin/ check out process. We had an awesome stay! This is our second year at A creek runs through it and we really enjoyed the cabin and the creek. Its a wonderful cabin and great for families with little kids. Amber is always very courteous and sincere making sure everything is right. We enjoy seeing her on each visit. Jason was very helpful with maintenance and cabin appearance and doesn't make you uncomfortable with his presence on the property. Overall, we have never had anything but positive experiences with anyone on the staff. Thank you all. Our stay was wonderful and looking forward to our next trip. Overall was a wonderful experience looking to relax and unwind and we did just that perfect place to forget about things and just relax while,you hear people sometimes can't see anyone. In the four years we have been renting homes/cabins this was the best. It was very clean. It had the best stocked kitchen. The surrounding property was beautiful. The creek was just the right depth for our kids to play in. The towns of Blue Ridge and Ellijay weren't a very long drive from the cabin. We were a party of four adults and two 12 yr olds. Everyone, even the kids loved this place. We would love to return. Absolutely love this place.. definitely will be returning and I also own a company and will be using this place as a free vacation to my employees from time to time just to let others experience how great this place is.. The staff are wonderful and know you by appearance. Our stay at A Creek Runs Thru It is truly a getaway. We love the dead end location and the privacy it offers. You are not bothered with traffic at all. We couldn't have been happier! We had an amazing time. It was a wonderful stay out, was not the cabin we chose they were doing some remodeling, but accommodated us with this cabin wonderful.